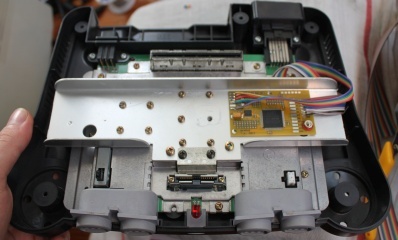 The N64 doesn't output RGB video, only encoded composite video and s-video is available on the A/V output port. It's best to use RGB video for the best looking picture. 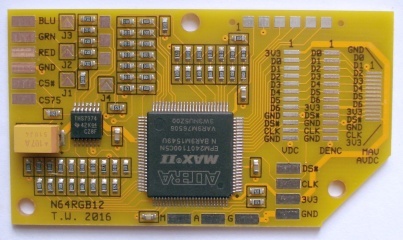 This board can be installed into any model of Nintendo 64. Digital signal from the from the graphics processor enter one side of the N64RGB and analogue RGB video comes out the other side. The board is a revised, commercial version of my N64 RGB DAC project created in 2007. This version has several improvements over the old design. Lower power consumption, correct pixel alignment (looks less blurry), support for different cable types, and the components are all mounted onto a PCB this time. The board supports both (PAL) Super Nintendo RGB SCART and Gamecube RGB SCART cables. The board is easy to to install for anybody who is experienced with soldering and following instructions. Boards sold after 27/12/2016 now come with software v1.1 which includes an optional 'de-blur' feature. This gives the video a pleasing sharp pixel look. The feature is disabled by default but can be enabled by connecting the the pad labelled A to the pad labelled G (for ground). If you use it I recommend a connecting a switch as few games don't look good while de-blur is enabled. This feature comes courtesy of Borti4938, who has written alternate software for the N64RGB. Buy from the online shop. 4/1/2017 - Added note about de-blur feature in new software. 9/6/2016 - Change the picture over to board version 1.2. 9/10/2015 - Change the picture over to board version 1.1.